This classic PDC features the largest display available and our patented Air Time Remaining calculations built right in. The Pro Plus 3.1 is "air-integrated", constantly monitoring your cylinder pressure and comparing it with your personal air consumption rate and decompression status to deliver your personal Dive Time Remaining based on the most limiting factor. Compass module as optional extra. The Air Time Remaining feature calculates current depth, tank pressure, your breathing rate, ascent time, and decompression status to tell you exactly how much time you can remain underwater. The Pro Plus 3.1 continually displays Air Time Remaining via a numerical bar graph in addition to cylinder pressure. You may also display Air Time Remaining in oversized digits at any time with the press of a button. The new Pro Plus 3.1 is as versatile underwater as it is topside. Upon starting your dive, the Pro Plus 2.1 will simply display your current depth, how long you can stay there and cylinder pressure. While many divers have asked for such simplicity and ease of use, you know that with all the Pro Plus 3.1's features, there must be more. And there is. Simply press the button to see more information. Is this information important to you on a full time basis? Leave it there. Just want to check it and then move on to another display? You can do that too. It's up to you and your new Pro Plus 2.1. Is it a good idea to check your computer before entering the water? You bet. Could you forget to activate your computer? Sure. The Pro Plus 3.1 features push-button or automatic activation, triggered by water contact. A benefit of push-button activation is easily verifying operation and cylinder pressure, but in case you forget, or simply choose not to activate your computer, it can be as simple as jumping in the water. The Pro Plus 3.1 features a variety of system and user-customized audible alarms, alerting you to situations that pose a potential danger, or simply serve as a convenient reminder. Have you ever had difficulty hearing your computer’s audible alarm? Perhaps that little beep signifying a potentially dangerous situation was timed perfectly with some large exhaust bubbles rushing past your ears. Or maybe it seemed to be insignificant as that huge manta ray soared overhead. You won’t miss the Pro Plus 3.1’s audible alarm. Once triggered, the alarm will sound continuously for 10 seconds. We know what you’re thinking… “That’s nice, I’ll definitely hear the alarm, but isn’t that going to annoy me and everyone else in the water?” We thought of that too. The alarm’s job is to get your attention so that you look at the computer. Once it does that, simply press the button and it will stop. You’re a responsible diver and Oceanic treats you that way. If you really want to exceed your pre-set maximum depth alarm by a couple of feet to capture that award-winning photograph – go ahead! The Pro Plus 3.1 acts simply as an ‘Air’ computer until you tell it otherwise, whether that is this weekend or 2 years down the road. As your training and experience grow, the Pro Plus 3.1 is designed to grow with you, being easily programmed for Nitrox mixtures from 21% to 50%. The Pro Plus 3.1 features time of day on the surface as well as underwater for quick reference. Time and date stamp also helps you to easily identify specific dives in Log Mode or PC download memory. The Pro Plus 3.1 features both a dual 12-hour countdown timer and calculated Desaturation Time, the theoretical time required to off-gas all residual nitrogen at sea level. Some computers simply flash an icon, telling you that you’re ascending too quickly. The Pro Plus 3.1’s Variable Ascent Rate Indicator bar graph acts as a speedometer, allowing you to very precisely control your ascent rate via the green, yellow, and red bar graph. The Pro Plus 3.1 features a depth-dependant ascent rate, allowing increased rates at deeper depths and providing additional safety as you near the surface. Want to verify your set mode options before your night dive? Press the side button to activate the backlight and go ahead! A small photo-sensor in the face of the Pro Plus 3.1 analyzes the intensity of ambient light each time another button is pressed. If it’s dark, SmartGlo backlighting will be there for you when you need it, and it will preserve battery life when you don’t. The Pro Plus 3.1 features on-unit data storage capacity for 24 dives. 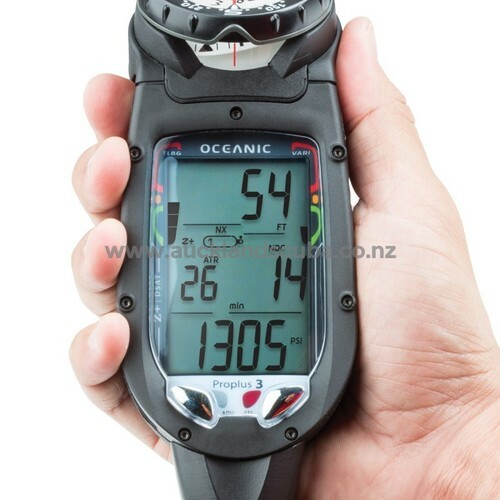 Date and time stamp makes locating and viewing a specific dive quick and easy. The Pro Plus 3.1 features a watertight, plug-in serial connection for fast and reliable PC download. Optional OceanLog software provides intuitive post-dive analysis and logging. You have the option to add and/or edit many pieces of information to customize your log book, with data such as depth and decompression status during a dive, maximum depth, bottom time, air consumption, air time remaining, no-decompression status, descent and ascent rate, surface interval, and any violations recorded automatically. In addition to detailed dive analysis, the optional OceanLog PC Interface also allows you to quickly and easily set all of your Pro Plus 3.1 settings and options directly through your PC. While Oceanic manuals and cue cards are simple to understand, some people learn better through hands-on experience. The on-unit Simulator Mode allows you to run the Pro Plus 3.1 through actual dive profiles including Air Dive, Nitrox, Gauge Mode, and Decompression. You will see the dive happen on the screen as you would in the water. Air consumption calculations may be activated, using a pre-set rate. As you dive the Pro Plus 3.1, the simulated consumption rate will be updated to reflect your own average. 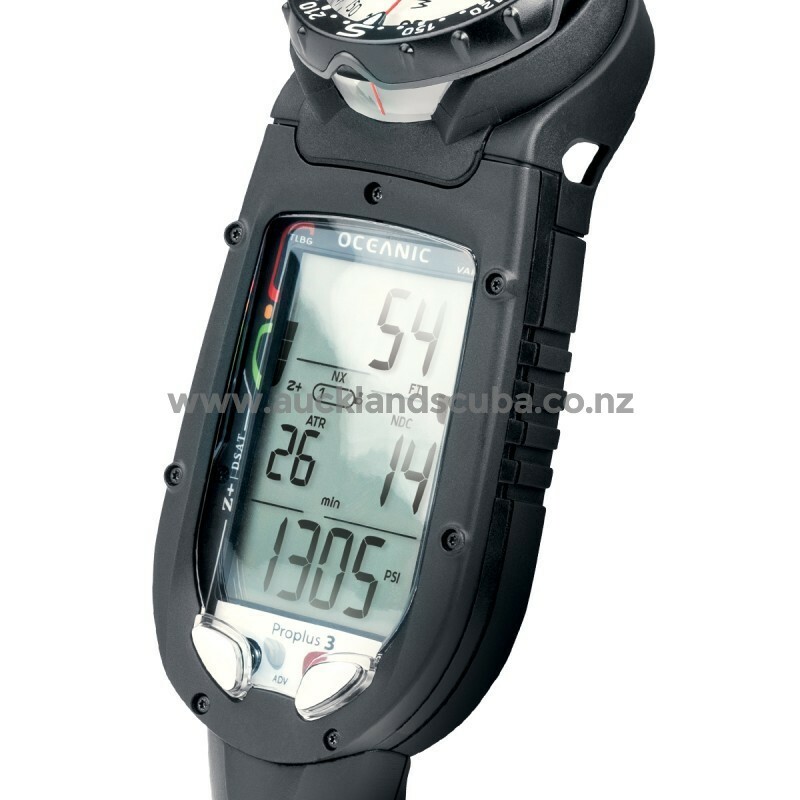 Divers using advanced breathing gas mixtures or otherwise conducting planned dives beyond the operational limits of the computer may utilize the Pro Plus 3.1 as an advanced air integrated digital depth gauge and bottom timer with detailed PC Interface. With a computer as advanced as the Pro Plus 3.1, you may have to push a lot of buttons to personalize it just the way you want. We have split the set mode into two separate menus. Set Mode 1 includes Nitrox mix, maximum depth alarm, and other options that may change from dive to dive. Set Mode 2 includes units of measurement, PC sampling rate, and other personal preferences that will most likely be set once and forgotten.